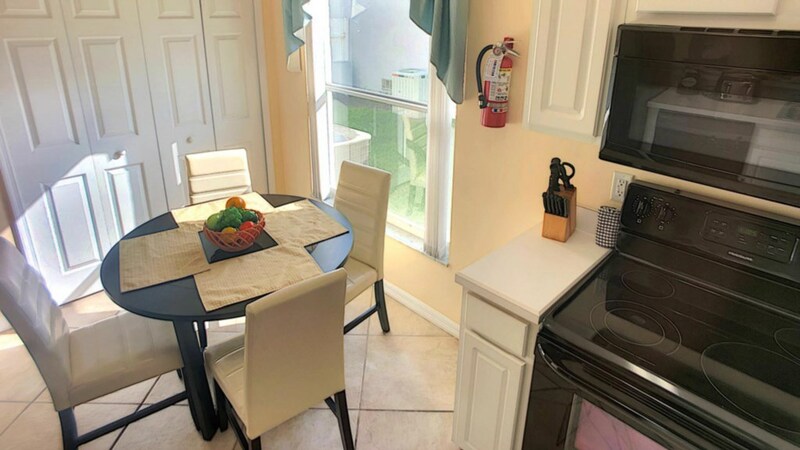 Comfortable 4 bed vcation pool home only 4 miles to Disney! Star Attraction Video from John Eastman on Vimeo. When your family stays in Star Attraction, you'll find that your every need is met before you even walk in the front door. 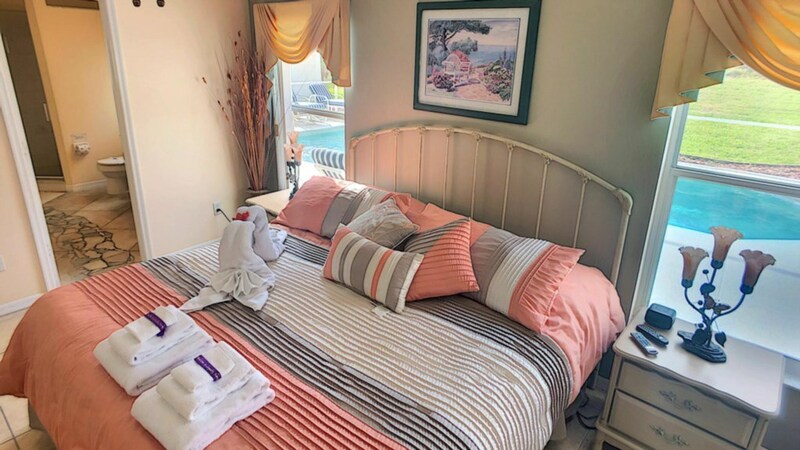 With 4 spacious and comfortable bedrooms sleeping up to 8 people, your family will love feeling at home in this perfect Disney vacation home. As soon as you walk in, you'll notice a large, plush wrap around sofa and a big screen TV. After a day at the parks, relax on the leather sofa and watch your favorite shows or put in a movie for the whole family to enjoy. The huge TV means that every seat is a great seat, and if someone is in the kitchen cooking, they can still keep an eye on the show from there!! Ready to eat? 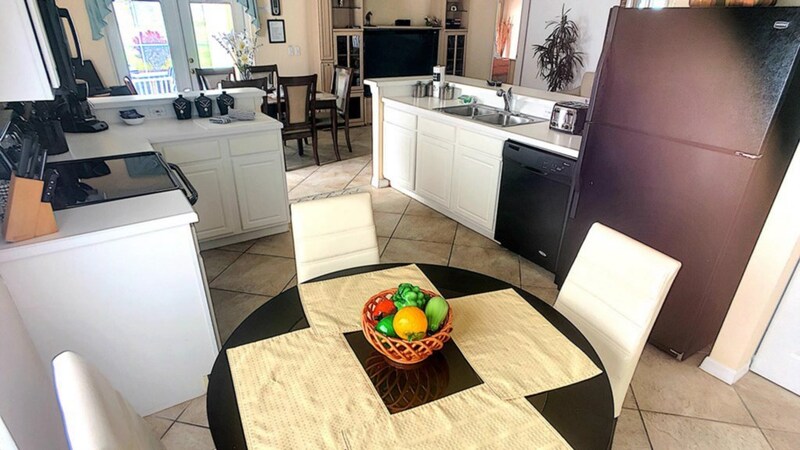 To your left is a kitchen that will keep the chef in your family completely satisfied with all the appliances, utensils, pots & pans that are needed. Cook the whole family a delicious meal to eat in the kitchen, at the breakfast bar or at the dining room table. Or maybe take lunch outside and eat by the pool on the covered lanai. 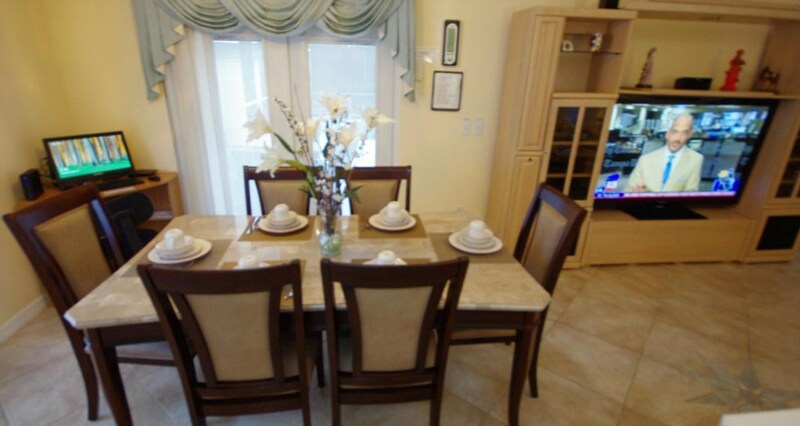 Wherever your family wants to eat, we made sure to have that option in this home! You'll keep your family entertained in the games room. Challenge each other to a friendly game of pool, foosball or air hockey. Or, turn on the huge TV and play some XBox. Love shooting hoops? No problem!! Enjoy the basketball arcade and see who can get the most baskets! When you're not playing in the games room, your family will want to spend all their time floating around the pool. With privacy fences on either side and no rear neighbors, you'll enjoy peace & quiet day and night in the pool. Soak up the sun on the comfortable chaise lounge chairs so you can make your friends & family at home envious of your fabulous vacation tan!! 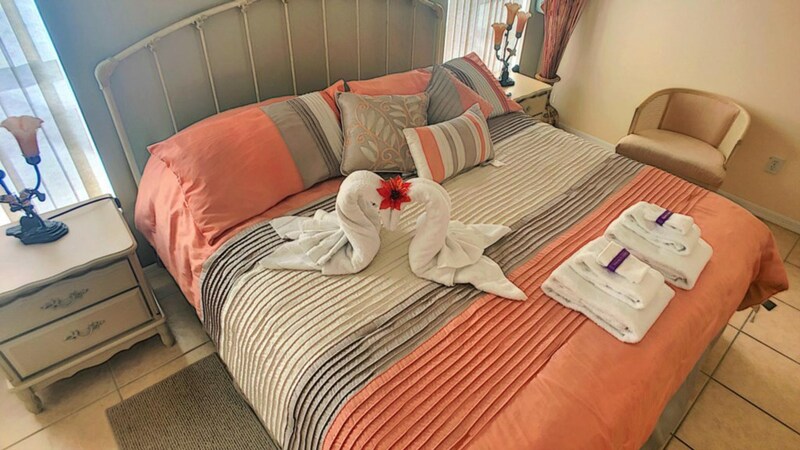 After a long day at Disney World or one of the other world class theme parks in Orlando, you'll find yourself melting into the comfortable beds. 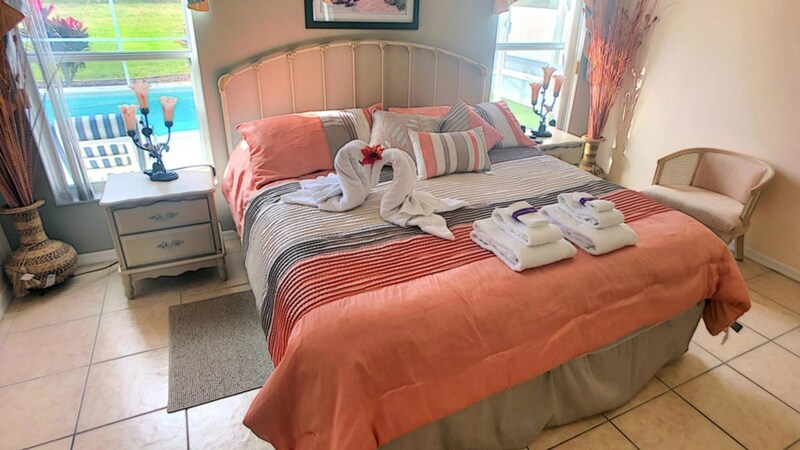 The master suite includes a luxurious king size bed with a large private bathroom and pool access. 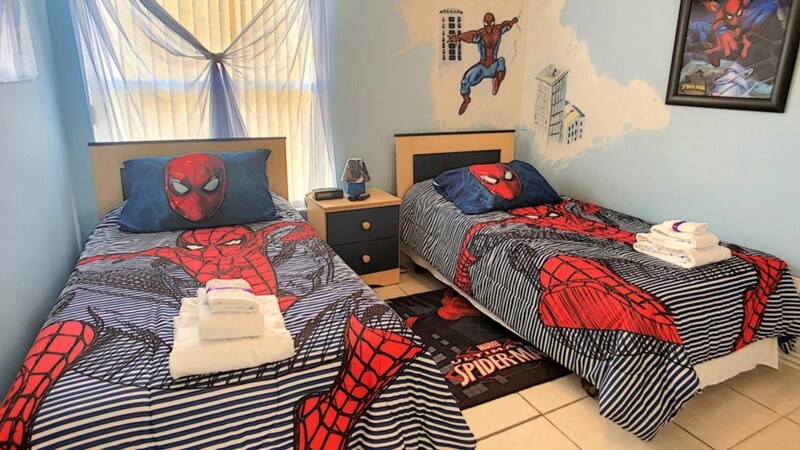 Boys & Girls will love the twin bedrooms, one with Spiderman theme and the other with cute Tinkerbell theme. The fourth bedroom has a comfortable queen size bed. All four bedrooms include flat screen TVs too, so everyone can watch whatever they like as they fall asleep. Free WiFi in the entire home means that you can browse Facebook on your phone from the comfortable sofa, your bed, or anywhere in the home. When we say that this home has it all, we mean it. 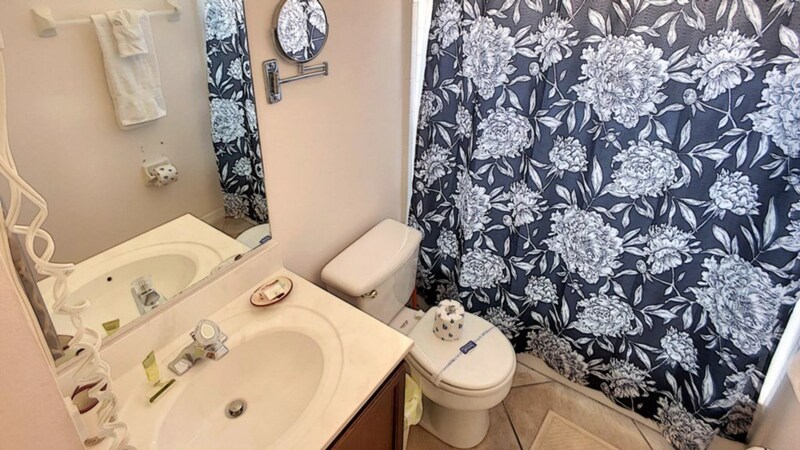 From all towels & linens to a computer & printer to washer & dryer, you'll be hard pressed to find something we missed when stocking this fantastic Kissimmee vacation home. Star Attraction is located in Indian Ridge Oaks, just 4 miles to Disney and a short drive to local attractions, shopping and restaurants. Ready to book your stay at this perfect vacation home? Call Now!! We love staying at Star attraction, Home is spacious, clean, and has all you need. Great pool, quiet and private. Close to the Disney parks, tons of restaurants and shops. nearby. Management is very helpful. It took me a long time to decide on a house to stay at as I am extremely picky and like things a certain way. I’ve had really bad experiences in the past so I was a bit nervous. I have no words for how satisfied I was with this particular house. It was extremely clean, the pictures don’t do it justice! They had excellent customer service, the booking process was so easy and I highly highly highly recommend them. I will definitely be booking with them again every single time I go to Florida without any hestitation! Everything was good, Perfect Check in, have a code on the door. Also room enough for 2 families plus 2 kids. we where 4 adult single persons, so 2 of us had to sleep in a kids room, but this was not an issue at all. House has everything you need, also some common stuff is already on location (tabs for washing machine, salt, pepper etc.) WalMart is an 5 minutes drive away at main gate, also lots of restaurants are there. 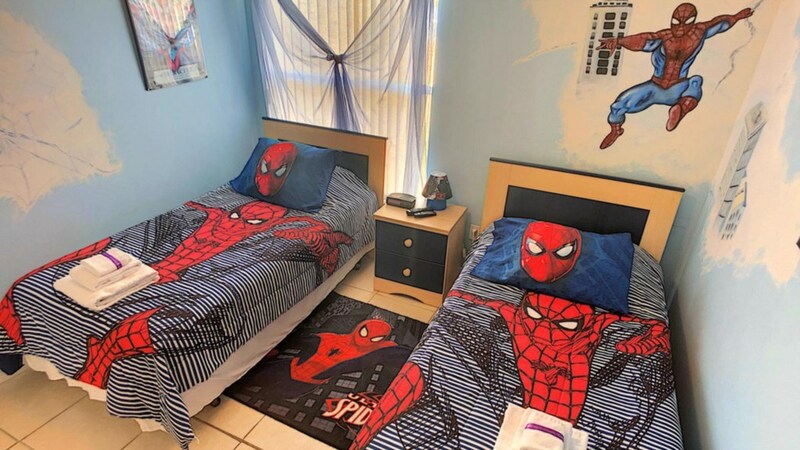 perfect place for a stay in disney area. in the night it was really quite, no big noise etc. *Review (5 stars):* The house was lovely and our family had a great time staying there. It was clean, well equipped and comfortable. We had some issue with the dishwasher, but Kelly was very helpful and did everything in her power to help us. Overall, we had a wonderful vacation. We had a great time staying at this wonderful house. We all loved the pool and the game room. The house is very close to Disney and Universal Studios. We were also happy that we were able to bring our dog with us on vacation. We can't wait to go back!